An age-old way of encouraging a love of books and reading with young children is to get them to make their own books, so they have some ownership, so they are familiar with them and can ‘read’ them confidently, even if it is by memory or simply making it up as they go. The important thing is that both parents and teachers are instilling this love of reading and literature with children early on. With young students starting out in primary school the creation of their own books usually involves a repetitive text structure and includes some high-frequency words to set a foundation for early reading strategies. I started by sharing a book with students titled ‘In the Garden’ this is a FREE iPad book app published by Harper Collins Publishers (they actually have several early reader book apps in the iTunes store). This book featured a repetitive text structure and included vocabulary that most students were familiar with. 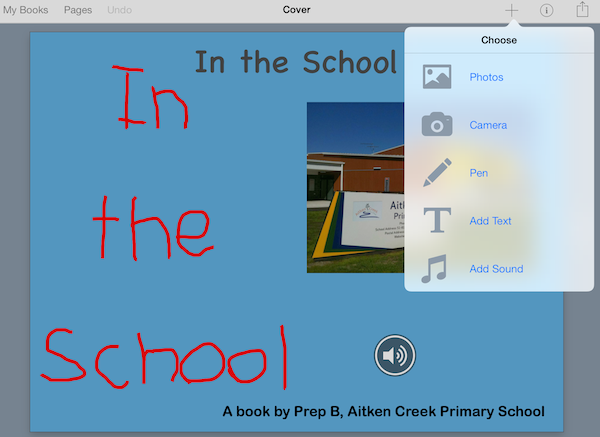 After reading the book a few times I asked students if they would like to make a book like this… ‘a special iPad book’ I think were the words I used and the excitement began to boil, looks of wonder and amazement, then came the questions… “But how Miss Spink?” Well there is this app that I like to use called Book Creator, it lets you make any kind of book you want….and then they were hooked. To create the books, students illustrated their own drawings of places around the school. They attempted to write or copy their sentences and took pictures of places around the school to add to the book. As they are early writer’s, I thought it was important for them to do this on paper as well as using the iPad, doing it more than once gave them more opportunities to practice their letter formation and develop fine motor skills. Another great feature that was included was the students narrating the story, they were already so confident with the repeating text structure that recording the story meant they could ‘read’ it. The excitement the children showed throughout this experience was so heartwarming- watching these students who had only been at the school for a few weeks, plan, create and publish their own book was wonderful. I put together a list of links to the AusVELS curriculum, which you can see here. 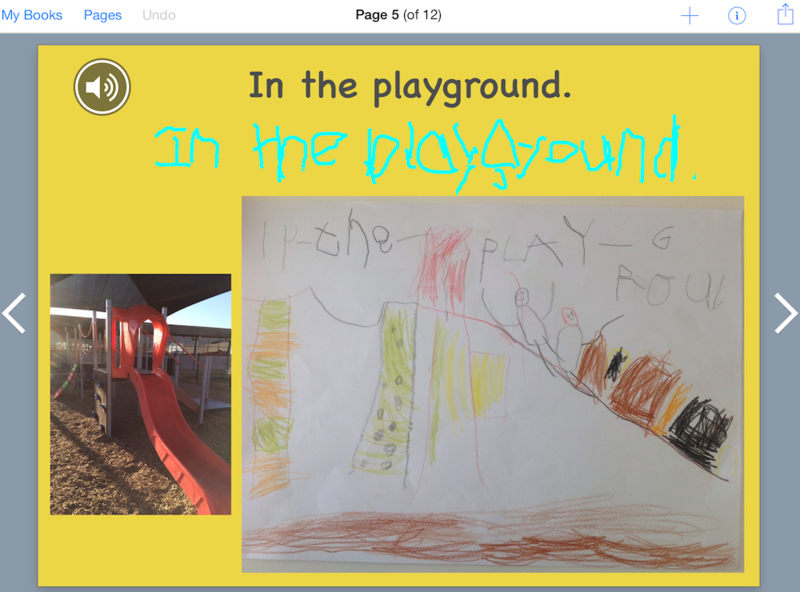 The Book Creator app is really easy to use. After modelling it a couple of times, most students could locate the pencil to draw, add an image and record audio independently. I alternated between doing sections as a whole class and small groups and pairs of students- this ensured that every student was able to have input and take ownership over the creation of the book. What I found really interesting was the level of discussion about what size the images should be and what colours the text and background of each page should be…this was all student driven. I also loved hearing about students reading the book at home with their parents- as I only teach them for one hour a week, it was great seeing some of the students running up to me excitedly in the playground just to tell me they got the book on their iPad at home and read it to “everyone”! To upload a book to the iTunes store you need to sign up to iTunes Connect using your Apple ID and download iTunes Producer to your Mac. The process is fairly simple- follow the prompts and you will have your book uploaded in no time. I have found that when submitting the books, they take about a week for approval. You will receive an email when the book is available in the iBooks store. You can download one of the books here. The other two are currently uploaded, waiting for approval. You can also search for ‘ACPS’ in the iBooks store to download some other books some of my former students have created. Last week the Book Creator team (follow them on Twitter here) added Prep B’s iBook to their ‘hall of fame’ page on Pinterest. With over 4 million books created in Book Creator, I think that is a such a great achievement and has given the students such recognition of their work. What is even more exciting for these students is where they are choosing to go next, I have left it up to them. One class is making a counting book in English and Spanish (Students have recently started learning Spanish at school) and I have found a bilingual class in America that will be helping with the Spanish part. So not only are these students creating another book but they are going to have the opportunity to participate in an authentic global connection. Win, win. One of the other classes wanted to write about dinosaurs, so they are using the augmented reality app, ARDinopark, to take pictures of dinosaurs ‘doing’ things around the school, they started their planning for this last week and I can’t wait to see their final product. I love that these are student ideas- I am just providing them with the tools and resources in order for them to be successful. Moving ”from the sage on the stage to guide the on the side”, providing opportunities for purposeful, student centered learning. So in the beginning, some at my school may have said I was “too adventurous”, I just wanted to have fun with the students. I did and the benefits to their learning is clearly evident.